India Yamaha Motor, the local subsidiary of the Japanese bike manufacturer, has launched two new colours for the Yamaha FZS FI dual disc variant. – Matte Green and Darknight. The recently launched motorcycle has an ex-showroom price of Rs 87,042. With this, the dual disc variant of the FZ FI is now available in three paint options. The Yamaha FZS FI dual disc variant was first launched in January this year and was on sale only in one paint scheme – Armada Blue. With the introduction of the two new paint options, the buyers of this well-sorted motorcycle will now be able to pick between three attractive colours. The new paint schemes command a small price premium of Rs 1,000. In comparison to the single disc variant, the Yamaha FZS FI dual disc model with new paint schemes costs Rs 4,000 higher. Interestingly, the FZS FI gets two new colours only a few days ahead of the launch of the Bajaj Pulsar NS 160 dual disc variant. Powering the Yamaha FZS FI is a 149cc, single-cylinder, fuel-injected motor that outputs a maximum power of 13 bhp along with a peak torque of 12.8 Nm. The motor comes mated to a five-speed manual transmission. It has a maximum fuel-carrying capacity of 12-litres and a kerb weight of 133 KGs. The motorcycle gets 282 mm disc brake at front and a 220 mm unit at the rear. It rides on 17-inch wheels shod with 100-section tire up front and 140-section rubber at the rear. Suspension duties are handled by 41 mm telescopic forks up front and a monoshock unit at the rear. 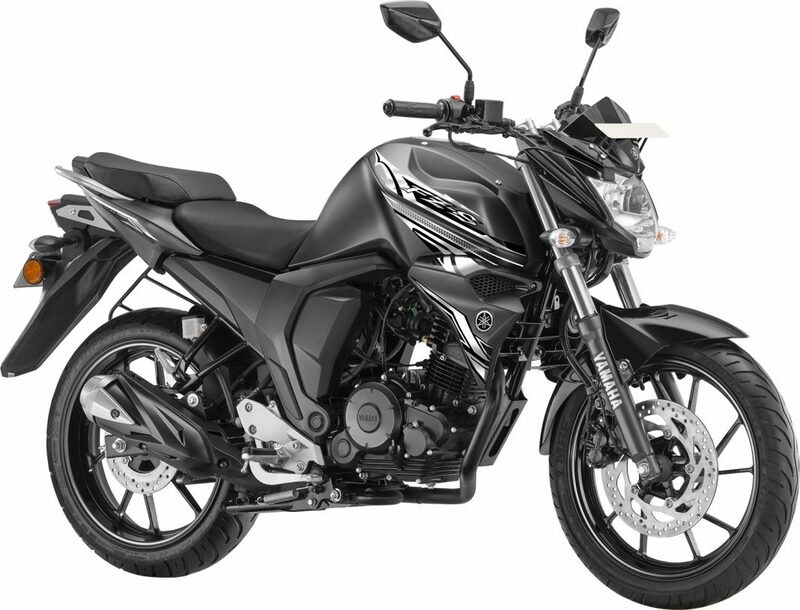 In India, the Yamaha FZS FI range has a base ex-showroom price of 83,042. The updated motorcycle rivals models like the Bajaj Pulsar NS160, Honda CB Hornet, Honda X-Blade, Suzuki Gixxer, and TVS Apache RTR 160.